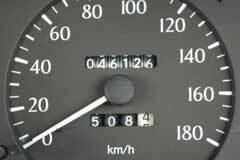 Before you can understand how to rewind odometer, it's important to understand how they work. Mechanical odometers are turned with bendable cable made from a highly wound spring. This cable spins inside a protective metal tube. With a car, the gear triggers the output shaft of the transmission and this rotates the cable. An example is an odometer that uses a group of three worn gears to achieve gear reduction. Here, the input shaft triggers the first worm, which in turn drives a gear. With every full rotation of the worn, the gear only turns one tooth. This gear turns another worm and that turns another gear. That turns the last worm and the final gear. This last gear is hooked to a 1/10th of a mile indicator. Each of the indicators has a line of pegs sticking out one of the sides, along with a single set of 2 pegs protruding from the other side. As the set of 2 pegs moves around to the plastic white gears, a tooth descends between the pegs and this rotates with the indicator until the pegs pass. As well, this gear triggers one of the pegs on the next bigger indicator, moving it 1/10th of a rotation. This explains why when your odometer 'moves over' a large number of digits (13,999 to 14,000), the '4' on the left side won't be lined up perfectly with the other numbers. A small amount of gear lash in the white helper gears stops the numbers from lining up perfectly. So now the big question, can you rewind your odometer? A mechanical odometer, yes you can. If you run your car in reverse, your odometer can go backwards as it is simply a gear train. Another method of doing this is hooking the odometer up to a drill and running it backwards, this will rewind your miles. When it comes to a computerized odometer, you aren't able to roll the odometer back. Let's see how this type of odometer works. Most modern cars implement a system of using a toothed wheel thats hooked to the output of the transmission and a simple magnetic sensor that counts the pulses of every tooth of the wheel that passes by. There are some vehicles that use a slotted wheel, along with optical pickup. The vehicle computer knows exactly how far the vehicle travels with each pulse and it uses this distance to update the odometer. It's neat how the information is forwarded to the dashboard. The distance and lots of other data, is sent over a single wire communications bus from the ECU or engine control unit, to the dashboard. The vehicle acts as a local area network with lots of different devices hooked to it. It's the ECU that adds up all the pulses and stores them over the distance travelled by the vehicle. So if someone attempts to roll back the odometer, the number in the memory of the ECU will disagree. Of course the ECU value can be read by a specialized diagnostic computer which all car dealerships have. Numerous times per second the engine control unit shoots out a block of information that holds the header of the data. A 'header' is simply a value that identifies the packet as a distance reading. This data is a value relating to the actual distance travelled. As well, the panel contains another computer that is programmed to look for this packet. When it sees one it will automatically update the odometer with another number. Vehicles that have a digital odometer just see a new number. Vehicles with analog odometers contain a stepper motor that rotates the odometer dials.